Video playback on the Acer Predator X34 ultrawide monitor is impressive. Whether it be a home video or a YouTube clip, the extra screen real estate on the sides increases immersion. However, most videos are 16:9 widescreen, and playing back most content results in vertical black bars on the left and right sides of the video in fullscreen mode. We can adjust the crop ratio in VLC to 2:39:1 that will fill the video to the entire monitor, but this requires manual adjustment upon each video playback. Is there a way to configure VLC so that it will automatically crop to 2.39:1 when videos are played back? Playing a 16:9 widescreen video at fullscreen on the ultra widescreen Predator X34 monitor results in black bars to the left and right of the video. Shown here is the video Big Buck Bunny. In VLC, we can press the C key on the keyboard to cycle through the various crop settings that will expand the video to fill the Predator’s screen space. We are dealing with cropping, not aspect ratio, because we want to preserve the original aspect ratio of the video (no stretching; circles should be circles). 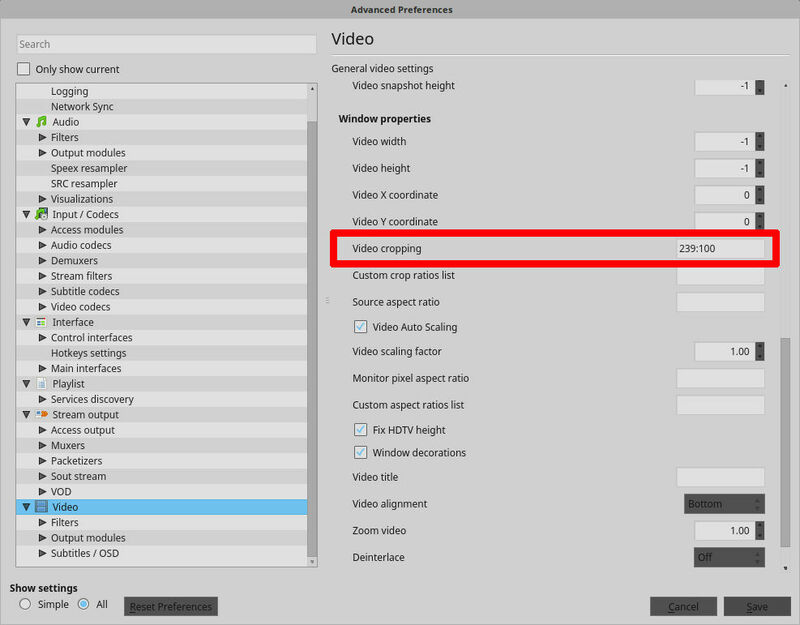 VLC lets us change the crop setting as the video is playing. Simply press the C key on the keyboard. The correct crop ratio for the Predator X34 is 2.39:1. This will fill the entire screen without distorting the image. However, it shaves a part of the video off the top and bottom. The width is preserved. The result is good if you do not mind missing some image area from the top and bottom. For 2.35:1 videos, this is perfect since the video fills the monitor without cropping. And for those videos that place ultra widescreen content within 16:9 video (resulting in black bars all around), adjusting VLC’s crop ratio will fill the entire monitor without sacrificing image information. This requires manual adjustment each time a video plays in a new VLC window. We can easily make the crop change automatically to spare ourselves the added hassle of switching the crop settings. In VLC, open Preferences from the Tools menu. VLC Preferences. Look for Show settings in the bottom left. Under Show settings are two options: Simple and All. Select All. Choose All to open the Advanced Preferences. Advanced Preferences allows you to customize a variety of VLC options to your liking, but we are interested in the video section. Scroll to the bottom and choose video. In the right pane, scroll down to find Video cropping. This sets the default crop aspect ratio when a video is opened. It’s a ratio, so enter 239:100 for the 2.39:1 ratio needed. For some reason, this did not work when I entered 2.39:1, but multiplying both sides by 100 to create whole numbers did work. Save the changes and restart VLC. Now, any video should automatically default to the 2.39:1 cropped ratio whether it be in windowed mode or fullscreen. NOTE: Make sure that the Video Auto Scaling option is checked under Source Aspect Ratio. This way, the video scales to fit the window. VLC crops the video to 2.39:1. 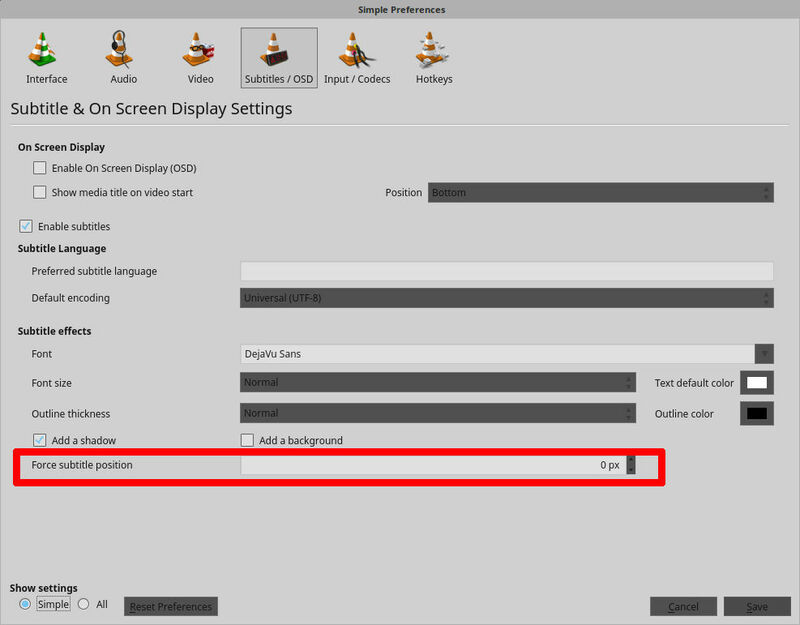 Good for fullscreen mode when played on the Predator X34 monitor. Press C on the keyboard (or manually select from the context menu) to cycle through the other crop ratios if you want to change the crop ratio for the current video. This can depend upon the video source. For many videos tested, subtitles automatically adjusted to the new location at the bottom of the video window. No problems. Other times, subtitles would appear in the center of the video at 2.39:1 ratio but return to normal at the bottom of the screen when the video played at its native 16:9 ratio. This requires adjusting the subtitle location in the VLC Preferences. Force subtitle position in the Subtitles / OSD pane adjusts where subtitles appear. Positive values move the subtitles up, and negative values move the subtitles down. Fine-tuning is also available in the Advanced Preferences, but this is quicker to access and usually sufficient. This entry was posted on December 4, 2017, 8:54 PM and is filed under linux. You can follow any responses to this entry through RSS 2.0. You can leave a response, or trackback from your own site.